I was so excited to get Kawaii Box to review for you guys! It was sent in exchange for a review and a giveaway. I love the idea of getting Japanese/Korean 'fun stuff' and really love that it actually comes from Singapore! Check the end of the post for the giveaway! What is it? 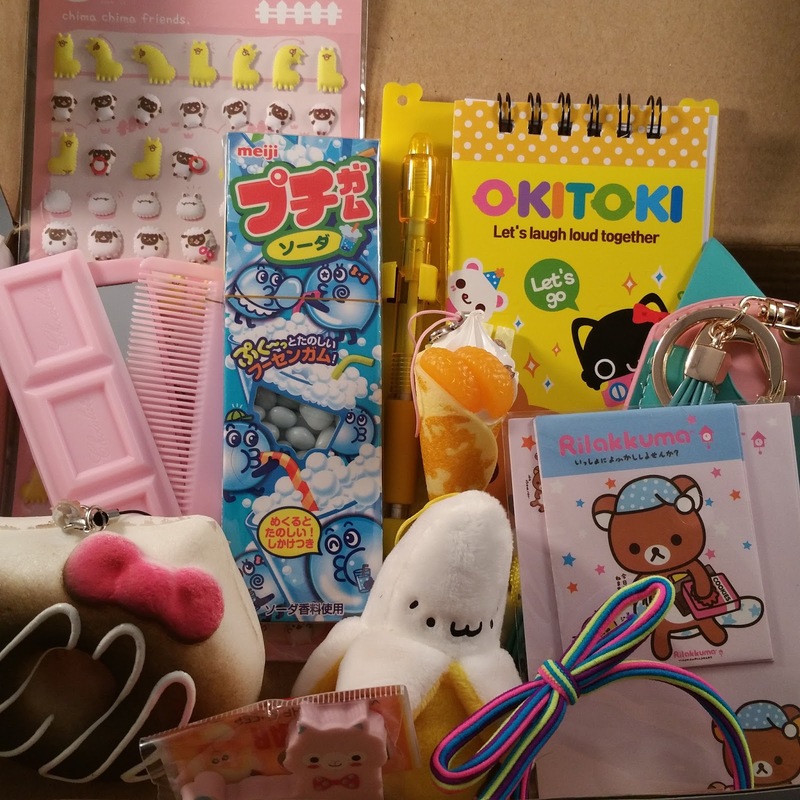 : Kawaii Box is a monthly subscription box that sends you 10-12 Japanese and Korean Kawaii products! It ships straight from Singapore, so it's the real deal. It ships on the 20th of every month, so be sure to sign up quick! How Much is it? : Monthly, it is $18.90 shipped. The price goes down based on longer subscriptions. Instantly, you know this is going to be adorable. The box looks like the perfect little present! Alpaca Stickers - These stickers are to die for. They are 3D, and I have a feeling they will be going on everything I can get my hands on. The different designs and animals are so adorable that I just can't stand it. Alpaca Eraser - I'm loving this alpaca theme that's going on already. This is an eraser that I won't be using, but it will instead be put on my desk to be displayed in all of its cuteness! Banana Mini Plush - This is something that would look cute on anyone's keys. It's nicely made and doesn't feel like it would fall apart easily, and it's a cute banana! Doughnut Squishy Charm - This reminds me of Hello Kitty, but it's not named that. If anyone else feels this way, let me know! It is a little sticky on the front, but I'm sure that will go away after I've had it for a bit. Neon Bow Hair Band - I've already worn this, and it was adorable. I used it in conjunction with a hair band, so it wasn't used to anything besides decoration, but it still feels like it could hold up all of my hair if I tried to. 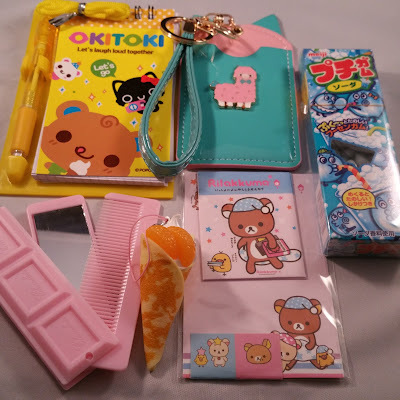 Okitoki Notebook Set - I love these little notebook sets. They are the perfect size for my purse and I have cute notes to look at later! A string accompanied it, so I guess it can be used to make the notebook into something that can hang! Chocolate Bar Comb - This is exactly what I would have used when I was a little girl. It's a cute pink chocolate bar, but it's also a mirror and a comb. Alpaca Card Holder - This is the winner of the box, that's for sure. I have seen these a few times and I was hoping I would get something similar. The fact that it has an alpaca on it makes it even better. I'll be using mine for my apartment gate card and have it attached to my purse! Harajuku Crepe Charm - I never would have thought this was a crepe if it had not been for the card. It's cute, but it's not what I think about when I think crepe. 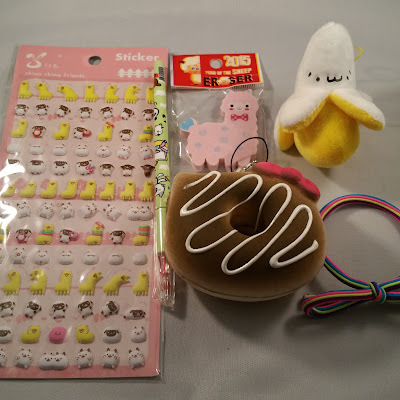 Rilakkuma Mini Letter Set - This is such a cute little set. It would be such a cute thing to have a child write their own little notes on to send off or just to have! Meiji Petit Gum - From searching Google, it seems as if this is 'soda' flavor and you're supposed to chew about ten pieces to get enough. The pieces are very small, so I can see that being the case. I'm not sure what 'soda' taste is supposed to be, though! 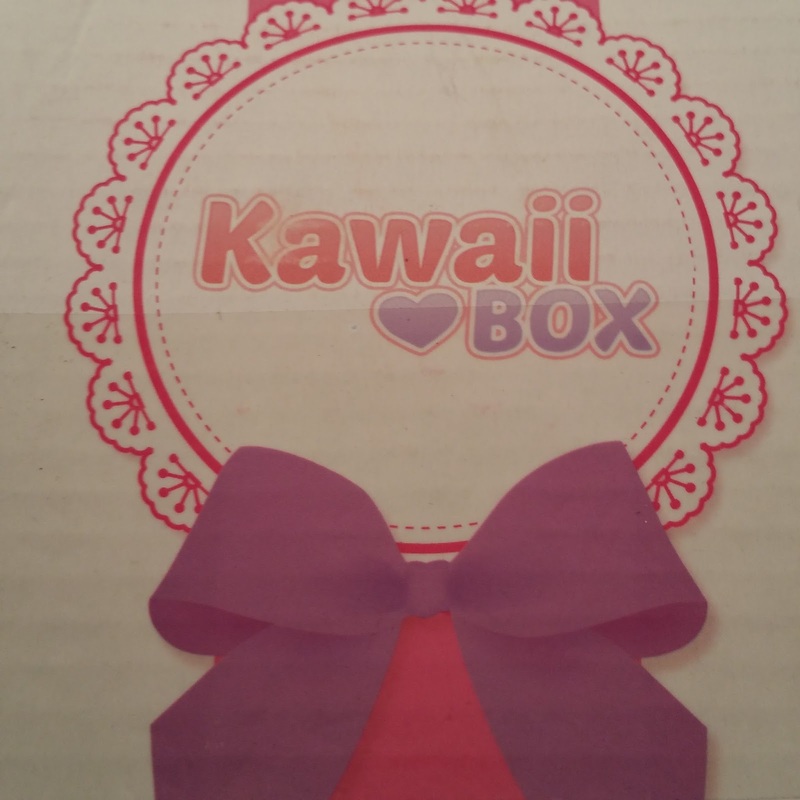 Overall, this was an adorable box to be able to review! 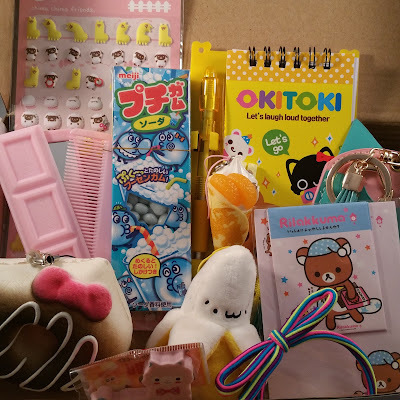 It's a great way to get cute Kawaii items that are authentic and would be a great present for a child to get! Everything tied together nicely and seemed very real to me. Now to the giveaway information! 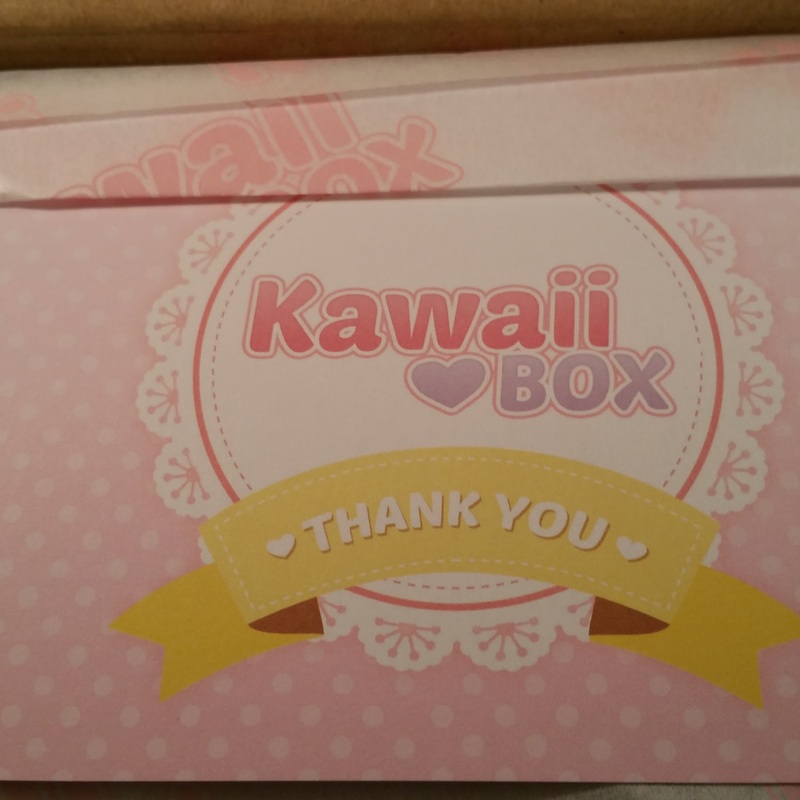 Kawaii Box has asked me to host a giveaway for them, and I graciously accepted. As always, let me know what you thought about this box! This box was sent to me in exchange for a review and hosting a giveaway. Giveaway winner will be chosen by Kawaii Box and will be sent their prize by Kawaii Box. 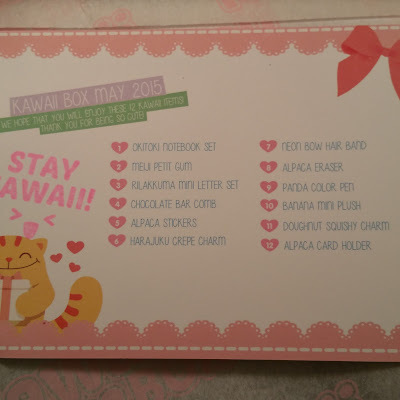 Rafflecopter was created and is maintained by Kawaii Box, along with all options. Ramblings of a Subscription Addict is not responsible for lost prizes or anything outside of hosting the giveaway on this.